The Enviro-Tub is an innovative secondary containment enclosure. The resourceful design acts as a retro-fit for all single wall tanks. 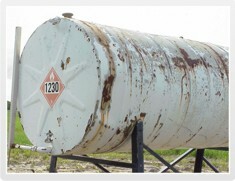 The unequalled construction allows for storage of most Steel, Plastic and Fibreglass tank designs. The secondary containment tub exceeds the 110% capacity specified by the A.E.U.B.G. -55 guidelines. The covered plastic tub will keep out rain, snow, leaves and other debris to protect the life and finish of the primary tank. No expensive leak detection equipment is required because the design provides convenient quick access for inspection. 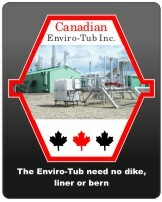 The Enviro-Tub eliminates the problems and costs that are associated with other secondary containment systems ex. vacuum truck, disposal fees, and most importantly eliminating the need to remediate our precious water and soils. 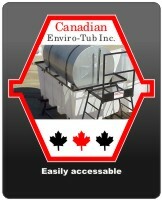 The Enviro-Tub’s unique design allows you the opportunity for countless applications. 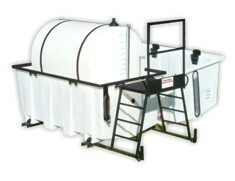 The Enviro-Tub can be mounted on the unique four and seven foot stand configurations or mounted on most existing skid packages. As in any business the bottom line is what counts. 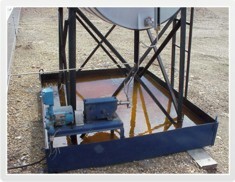 The Enviro-Tub will eliminate two major costs associated with the use of spill Trays. Vacuum Trucks can cost hundreds of dollars per hour. During a heavy rain period, or in areas of irrigation you may need a truck every day. Disposal of this fluid adds more expense. This expense can be eliminated from your budget with the Enviro-Tub. Environmental cleanup is expensive. A leak from a 500-gallon tank that reached a waterway can easily result in a cleanup bill of six-figures or more. This is preventable with the Enviro-Tub. If the primary container fails with a large amount of fluid in the collection tray, your product will spill onto the ground. The resulting clean-up costs and loss of your product will erode your bottom line. This is preventable with the Enviro-Tub. Lack of protection from the elements can significantly shorten the life of the primary container resulting in escalated repair and replacement costs. This is preventable with Enviro-Tub. Protecting the environment and complying with the new and increasing environmental guidelines has become a priority for many companies and individuals today. 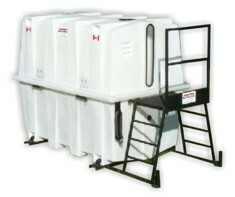 The Enviro-Tub exceeds the AEUBG-55 guidelines. Seeing the Enviro-Tub on your land shows a true commitment to keeping our environment clean for generations to come. Copyright © 2019 Enviro-Tub.com. All Rights Reserved. Designed by Tansi Media.